An asteroid will give Earth a historically close shave next week, but there's no chance that the space rock will slam into our planet on this pass, experts say. The 150-foot-wide (45 meters) asteroid 2012 DA14 will zoom within 17,200 miles (27,700 kilometers) of our planet on Feb. 15, coming nearer than the ring of satellites in geosynchronous orbit. While the flyby will be the closest ever known in advance for such a large asteroid, there's no reason to retreat to the doomsday bunker. "NASA's Near-Earth Object Program Office can accurately predict the asteroid's path with the observations obtained, and it is therefore known that there is no chance that the asteroid might be on a collision course with Earth," officials at the space agency's Jet Propulsion Laboratory in Pasadena, Calif., wrote in a statement Friday (Feb. 1). NASA will hold a press conference at 2 p.m. EST (1900 GMT) this Thursday (Feb. 7) to discuss the space rock's close flyby. 2012 DA 14 was discovered in February of last year by astronomers with the La Sagra Sky Survey in Spain. The near-Earth asteroid has recently been zipping around the sun once every 368 days, though next week's close pass will reduce its orbital period to 317 days, researchers said. At its closest approach on Feb. 15, the space rock will be just 1/13th as far from Earth as the moon is. 2012 DA 14 will whiz by our planet quickly, zipping through space at about 17,400 mph (28,000 kph) as it makes its closest pass for at least the next 30 years. Researchers at NASA and other institutions plan to take advantage of the flyby to learn more about 2012 DA14 and its orbit. "Radar astronomers plan to take images of the asteroid about eight hours after closest approach using the Goldstone antenna in California's Mojave Desert, which is part of NASA's Deep Space Network," space agency officials wrote in Friday's statement. 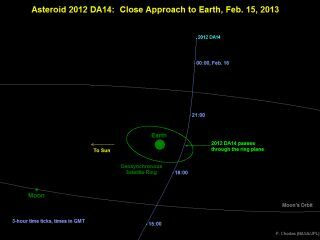 Several other known asteroids have given Earth an even closer shave than 2012 DA14 will, but those objects were all smaller. Asteroids of 2012 DA14's size probably make such close flybys once every 40 years and actually hit Earth every 1,200 years or so, researchers said. Of course, other relatively large asteroids have probably zipped very close to Earth recently without being spotted. Astronomers have identified more than 9,000 near-Earth asteroids to date, but perhaps a million or more such space rocks are thought to exist. If 2012 DA14 did strike our planet, it would likely cause serious damage on a local scale. An object of similar size flattened 800 square miles (2,000 square km) of forest when it exploded above Siberia's Podkamennaya Tunguska River in 1908.